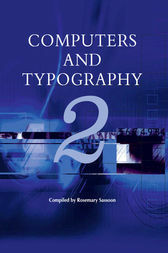 This second Volume of Computers and Typography reflects new developments in this rapidlychanging field. This book complements without in any way supplanting Volume1 through an extensive elaboration of issues that were considered only briefly the first Volume. Its aim is to alert those involved in computer interface design that the skills of layout, spacing and usage of type are equally vital in the constuction of onscreen layouts as they are on the printed page.